Hawker is one of my favourite outback towns and somewhere I could easily imagine living. Because we cross the Victoria/SA border for most trips we leave the fruit and veg shopping until Port Augusta. Now fully stocked we headed northward. As a family we have been wandering around this area for many years. I would always look forward to stopping at Hawker Motors which, at that time was not more than a couple of bowsers and a tin shed, complete with dunny down the back whose door had to be propped closed with a rock. But inside the tin shed was a treasure trove. Artefacts and memorabilia from a lifetime in the bush, collected by Fred Teague. It was a relief to find that when the new Hawker Motors service station opened the memorabilia and artefacts moved into a display area in the new building. As a kid I visited Panorama Guth in Alice Springs (long before it was destroyed by fire in 2005) and thought it the most amazing art work I had ever seen. 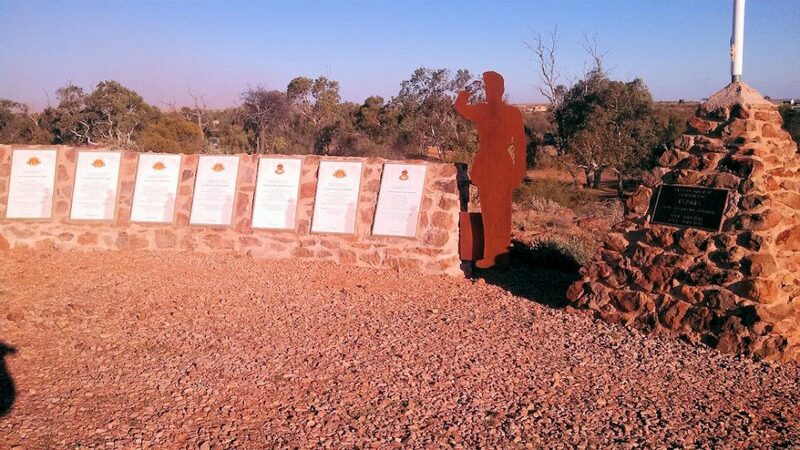 And then the Jeff Morgan opened the Wilpena Panorama in Hawker. Ten years in the making, the painting (technically a cyclorama as it depicts a 360° view) measures 3.5 metres by 33 metres and took 4000 hours to complete. It depicts the view from St Mary’s Peak, the highest peak of Wilpena Pound and the entire Flinders Ranges. 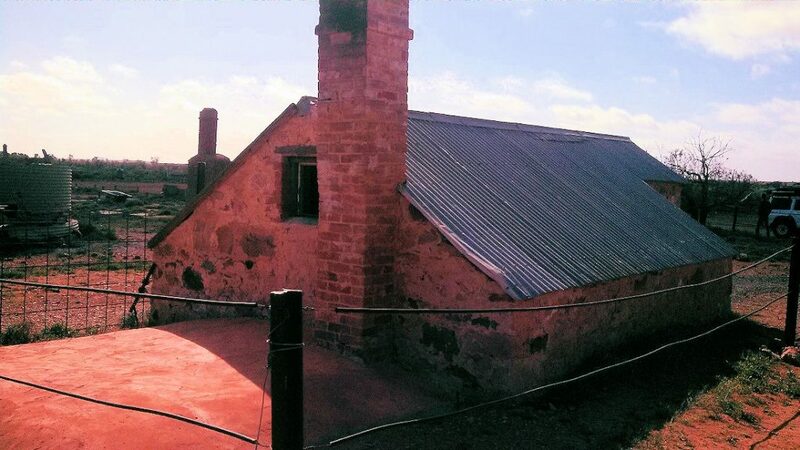 Jeff and his wife Miriam have decided to construct another panorama next to the existing Wilpena Panorama. This new panorama will be a view of the Arkaroola area, painted as if the viewer is standing in an almost dry creek bed. Jeff has already sourced the canvas from Gerriets in Hamburg Germany. This was the only company in the world they could find to provide a canvas 60 metres x 6 metres without any joins. Also on display are a number of other works by Jeff including several very large canvases (6 metre and 15 metre). Cost of entry to the gallery is $8 and includes tea, coffee and biscuits. I have a number of framed prints of Jeff’s work (I’m afraid the originals are beyond my budget) and this trip I chose a print from the Salute to Veterans called Soldier Ron M. I was delighted when Jeff told me that I had chosen a print of Private Ron McInnes in Vietnam. 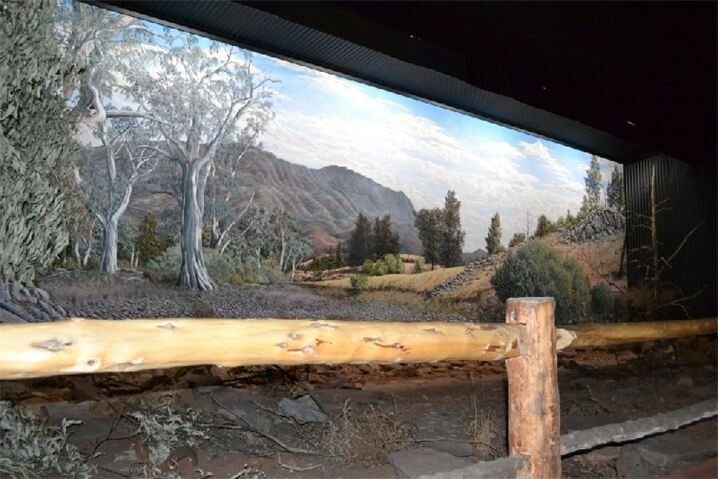 Ron and his wife Jenny own a cattle station nearby and it was Ron’s insistence that Jeff should paint an unnamed creek on his property that led to the spectacular 15 metre Ron’s Creek painting on display in the gallery. This is a must see on your outback trip. On this trip we didn’t dally in the fabulous Flinders Ranges but headed up the road to Leigh Creek. We had boxes of books and maps to deliver so this largely determined our route. Leigh Creek township was built in 1981 some thirteen kilometres south of the original township to allow for expansion of the open cut coal mine. 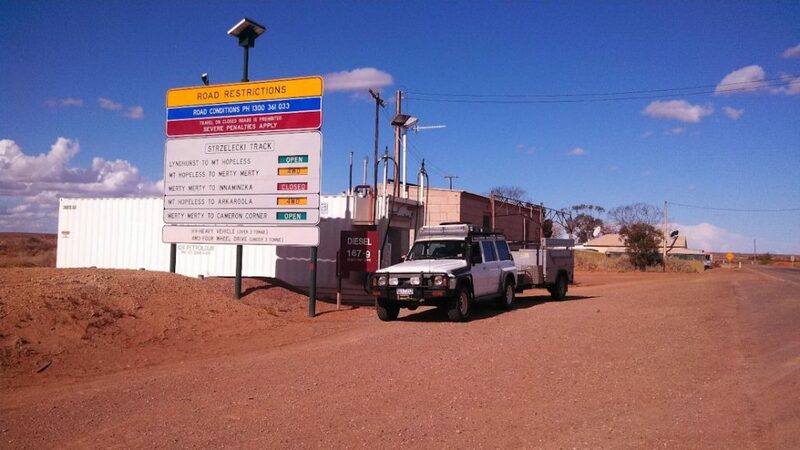 Leigh Creek’s fortunes have wavered from a population of 2500 in 1987 to about 500 currently. Most residents work in the mine or in jobs supporting the workers in the mine. When we arrived the town was in a state of shock and despair as the owners of the mine Alinta Energy had announced that the mine will close by November 17 this year. The nearby town of Copley also relies on the mine for employment and the closure will mean the loss of about 450 jobs. We spoke to Liz at the Open Cut Café. She has spent a lot of time setting up a collection of local artefacts and memorabilia from the local area to have a display in the information centre. A task force had set up in one of the nearby shops to try to work out how to maintain facilities like hospital, school, supermarket etc. Liz’s business is for sale as she will move with her husband, a miner as he takes up employment at another mine. Liz told me they don’t want to leave town but like everyone, they need to follow the work. The coal mined in the area is only used in the two remaining coal-fired power stations in South Australia, both at Port Augusta. The decision to close the power stations in favour of renewable energy has been known for some time but it was expected that the mine would remain until 2018. The next 12 months will be a time of transition for Leigh Creek. Our next stop was the Lyndhurst Hotel to meet the new manager. Erica has taken over the hotel from the previous owner Adrian Kellow. The hotel also has accommodation and fuel sales and as Erica is a local she has all the information about road conditions (although the great big sign right in front of the pub also tells you when the roads are open or closed). It’s a good little spot to be if you do happen to get stuck when the roads are closed. 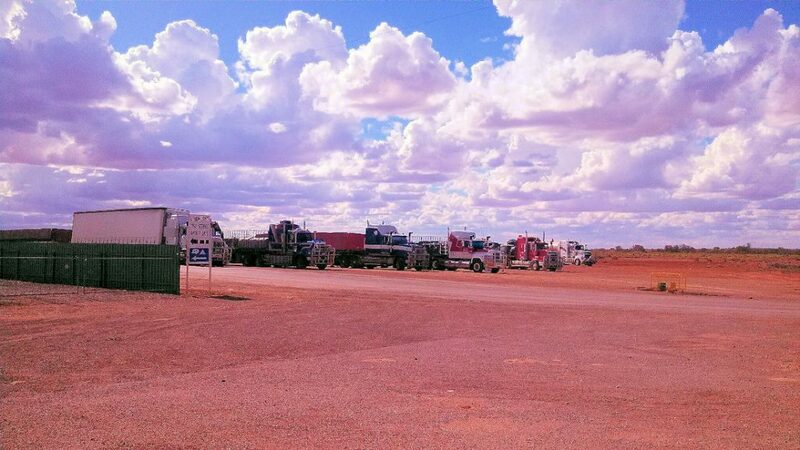 Many a tale is told by outback truck drivers when they are stuck there for a few days. We left Lyndhurst at about 4pm to head up the road to Farina for the night. The wind was starting to pick up when we left Lyndhurst and we soon noticed large areas of raised dust. By the time we got to Farina it was fairly wild outside. We were keen to check out the work being done by the Farina Restoration Group. Particularly the work done on the Anzac Memorial. I had been keen to go to Farina for their Anzac service but as we had a conference to attend in Canberra chose to attend the Anzac services there instead. With hindsight, I’m sure we would have been more comfortable with the 200 people at Farina with a small but heartfelt service than the 100,000 in Canberra with their polished services delivered with military precision. I did notice when doing some research for this story that the Anzac day service at Farina was only marred by the galeforce winds. Some things don’t change. A century ago Farina had about 250 residents and 33 of its finest went off to fight in the First World War. The Restoration group has erected a memorial wall with an information panel for each of the eight soldiers who lost their lives in WWI and WWII. The restoration group is the brainchild of Tom Harding and the owners of Farina Station, Kevin and Anne Dawes. Since 2009 the group have spent some 27,000 hours restoring the old buildings of Farina. It is quite incredible to see what they have achieved in that time. I was a little dismayed though to find that a new toilet and shower block had been built. It is much bigger and better than the old one, but our kids used to look forward to lighting the donkey and then having a shower in the block built out of old railway sleepers – as the wind whistled through the cracks in the walls. At least the donkey is still there so it still has some of its charm. Deciding it was far too windy to light said donkey we found a small clearing just big enough for the 4WD and swag. We scratched together a meal sitting in the car. Graeme is not a fan of couscous at the best of times – when it is made using luke-warm water from the thermos he is less than impressed. However the alternative was eating dust, so that makes most things palatable. From there we dived into the swag and bunkered down for the night. Our swag is at least 30 years old so it has no new-fangled poles or insect nets. It is basically a canvas sleeping bag with a longer top side to pull over your head if it is raining. A night spent with a piece of canvas over your face to stop the dust is a long night indeed. In the morning we were surprised that our tent (still in its bag) had blown off the roofrack. We have a centre-pole coach tent with the heavy metal top frame that weighs about 20 kilograms and it had landed quite some distance from the vehicle. We were lucky it didn’t land on us in the night and it made us more vigilant for the rest of the trip. We brushed the dirt off the swag and headed into Marree for our next delivery. While I was searching around on the Farina website I found this interesting story about one of the locals – Gool Mohammet. There are also many B&W photos of the area. Farina and the connection to Milparinka in New South Wales. In late 1882 famine and a lack of water was reaching such dire circumstances on the Albert Goldfields (Milparinka, NSW) that a relief supply was sent out by the NSW government. Surprisingly as it may seem today, the NSW relief party first went by ship to Port Augusta, then train on the recently completed railway to Farina and then by camel across the northern Flinders (probably via the then Mt Freeling police station and Terrapinna Waterhole). From there it followed the track, known today as the Mt Browne Track, which parallels the Yandama Creek across the Strzelecki Desert to the NSW border at Hawker Gate (so named back when the fence was built as it was the ‘gateway’ to Hawker and the Ghan railway line), and then east to Milparinka. Next up: Marree to Mungerannie. Nice post,thanks for sharing such informative post.